An electrical motor which converts electrical energy into mechanical energy is called motor. A motor which works on DC supply is called DC motor. It is a dc machine characterised by their versatility. There is not much difference between the construction of DC motor and DC generator. As motor is easy to control so it is used in various applications. l = length of conductor. When DC supply is given to motor, direct current passes through the brush and commutator to armature winding. When it is passed through commutator, it is converted into AC so that the group of the conductor under successive field poles carry current in the opposite direction. Let the current in armature conductors be outward under the N-pole and inward under the south pole. When field and armature circuit are connected across supply then direction of force on each conductor can be given by Fleming left hand rule. As each conductor experiences force so motor tends to move in the direction of force which is observed as clockwise direction. 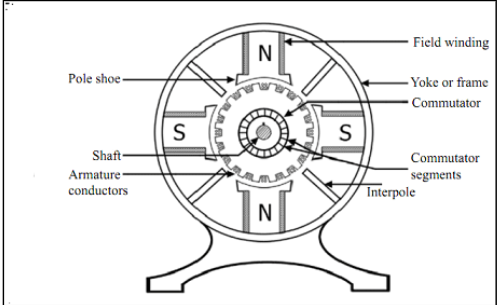 Current in the armature winding establishes N and S poles on the rotor and their interaction with stator N and S poles result in clockwise rotation of armature. Due to armature rotation, the conductors cut the same flux that give rise to motor torque. This cutting of flux action causes the generation of EMF in the same conductor that experiences motor action. This generated EMF is in the direction of the flow of conductor current. As this generated EMF opposes the flow of current so it is known as Back EMF or counter EMF. For the smooth working, applied voltage across the motor armature has to overcome the back emf and supply the armature ohmic drop. When back emf is increased, mechanical power as output also increases. Motor efficiency also increases with increase in back emf. The electromagnetic torque for DC machine is expressed in terms of interaction of main field flux and armature mmf. For motor, this electromagnetic torque helps to rotate the driven equipment. In starting, motor speed is zero and counter emf is also zero. Terminal voltage for all types of motor depends upon ra or ra +rs .Since this resistance are much smaller, the motor draws large armature current from the supply mains which may be as high as 1250A, much more than motor's rated current. It may result in spraking at the commutator, damage to armature winding, deterioration of insulation due to overheating, high starting torque and quick acceleration. So to avoid all these effects, armature current must be limited to a safe value by inserting a suitable resistance in the armature circuit. So, we need any starter to start the dc motor. Similar to generator, motor is also classified as series, shunt and compound motor. In shunt and seperately excited motors, the field flux is nearly constant. The shunt motor is substantially a constant speed motor with about 6% drop in speed from no load to full load. In series motor, when the load is increased, then armature current, mmf and stator field flux is also increased. When flux is increased, speed must drop to maintain the balance between voltage and back emf. So series motor has the property of verying speed with drop in speed torque characteristics. Therefore, it can be used in applications requiring heavy torque overloads. In compound motor, the series field may be connected either cumulatively so that its mmf adds to that of the shunt field or differentially so that it oppose. When the shunt field is directly connected across the line terminals with series field between it and armature, it is called long shunt compound motor. When shunt field is connected directly across the armature and series field between it and line terminals, it is called short shunt compound motor. 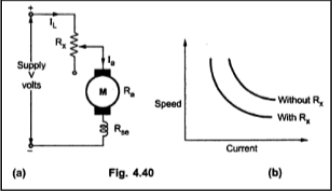 Speed current characteristics- In case of shunt motor, speed ic considered as constant on neglecting the armature reaction. While if we do not neglect armature reaction, then is some drop in the characteristics due to armature reaction. 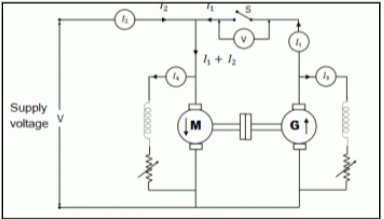 While for series motor, main flux is directly proportional to the armature current. So, speed torque characteristics of series motor is hyperbola. Torque current characteristics- In case of shunt motor, if flux is kept constant then torque would increase linearly with armature current. For series motor, torque is proportional to the square of the armature current and therefore torque current characteristics is a parabola. Speed torque characteristics- For shunt motors, with increase of torque the speed drops. In case of series motor, speed torque characteristics is hyperbola. For compound motor, there is high starting torque with a safe no-load speed. In case of shunt motor, it has wide application due to its variable speed characteristics. It can be done either by flux control method and rheostatic control method. 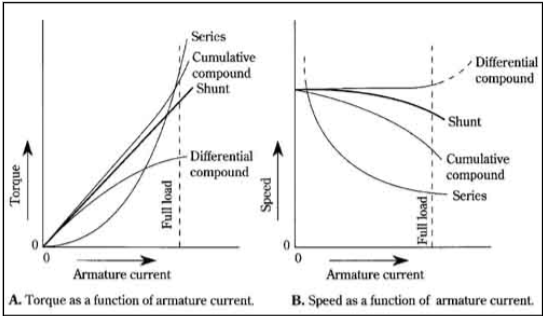 Variation of flux or flux control method- As speed is inversely proportional to flux for shunt motor. Hence speed can be increased or decreased by varying the flux. The flux of dc motor can be changed by changing shunt current with the help of shunt field rheostat. 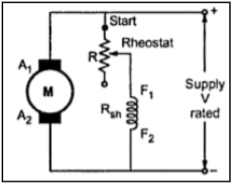 Since, shunt current is small, shunt field rheostat has to carry only small current which means copper loss is small so rheostat is small in size. It is vey efficient method. For machines with interpoles, a ratio of maximum to minimum speed of 6:1 is common. If flux is further decreased, it affects the communication and hence puts a limit to the maximum speed obtainable with the method. Armature or Rheostatic control method- This method is employed when speed below the no-load speed is required. The voltage across the armature is varied by inserting a variable rheostat or resistance in series with the armature circuit. As controller resistance is increased, power developed across armature is decreased. This lead to decrease armature speed. For a constant load, speed is approximately proportional to power developed across armature. Greater the resistance in the armature, greater is the fall in the speed of motor. Braking of dc motor is of two types, electromechanical and elecric breaking. 1. Electromechanical Braking- This brakes are operated by electromagnet or electric operated thrusters. It is a spring loaded brake with friction liners passing against the brake wheel. The brake is released when magnet is energised. This ensures power failure. In that case, brake automatically grips the wheel. Plugging braking- In this, connection to armature is reversed so that motor run in opposite direction. Due to reversal of connection, applied voltage and back emf start acting in the same direction around the circuit. In order to limit the armature current to reasonable value. It is necessary to insert a resistor in the circuit while reversing armature connection. Rheostatic braking- In this, the armature of the shunt motor is disconnected from the supply and is connected across a variable resistance. The field winding is left connected across the supply undisturbed. The braking effect is controlled by varying the series resistance. Regenerative braking- This method is used when the load on the motor has overhavling characteristics as in lowering of the case of a hoist of motor. Regenerative takes place when back emf becomes greater than V. This happens when the overhauling load acts as a prime mover and so drive the machine as a generator. Plugging- In this method the connection of armature are reversed and a variable resistance is put in series with armature. 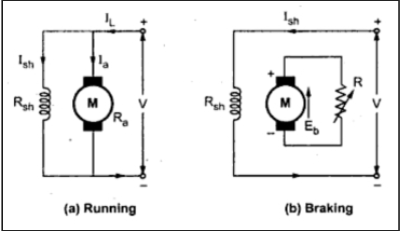 Regenerative braking- In a series motor, regenerative braking is not possible without modification because reversal of armature current would also mean the reversal of field and hence of back emf. 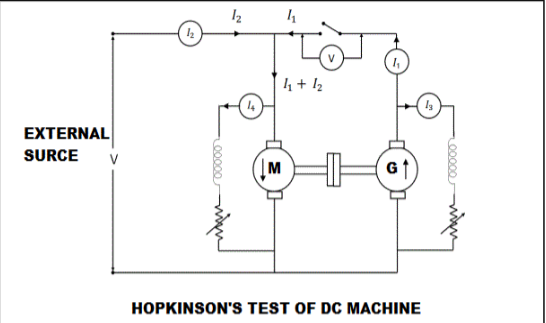 In hopkinson test, two identical DC machines are coupled both mechanically and electrically then tested simultaneously. One machine is made to run as a motor while other drives as a generator. One machine is started as a DC shunt motor by a starter and brought upto rated speed with switch is open. As both machines are mechanically coupled so both machines are run at the same speed. It is economical test because power required for the test is small as compared to the full load powers of the two machines. The two machines are tested under loaded conditions. The load test can be conducted over the complete load range in short time. Two identical machines are not available easily. Both machines can be loaded equally. There is different iron losses of two machines because of different excitations. As both machines can be loaded equally and this is crucial in smaller machines. Iron-losses can not be seperated easily. The full load in small machines is not obtained by cutting out all the external resistance of the generator field. This is a no-load test of motor. It cannot be performed on DC series motor. In this method, the machine whether it is a motor or a generator is run as a no-load shunt motor at rated speed and with rated terminal voltage V. In this, field current is adjusted to a rated value for accurate determination of no-load loss. Machine will run at higher speed than rated speed with rated armature voltage. A series resistor is employed in the armature circuit to reduce voltage applied to motor armature such that it runs at rated speed. It requires low power for testing even large machines since only no-load losses are to be supplied from the mains. Efficiency can be calculated at any desired load. Stray load losses can not be allocated. Actual performance of the machine on rated load can not be checked. DC shunt motor is preferred for adjustable speed service at low operating speed. DC shunt motor is used when driven load require wide range of speed control. DC series motor is used for driving hoists, trains, excavators, cranes etc. DC series motor can be used to drive permanently connected loads such as fan load. DC series motor is used in baterry driven automobiles. Ex 1: A shunt motor takes a total current of 20A from 250V supply. The shunt field and armature resistance are 200ohm and 0.3 ohm. Determine back emf and mechanical power developed in the armature. Armature power = EbIa = 4.58kW.